This fake eFax email message was in my inbox and the eFax email looked so real. I use eFax corporate and almost clicked on the link. However, in Outlook, if you mouse over the links in the email you can see what site you will be redirected to. eFax does not use just IP addresses in their real email messages. This was a totally fake eFax email message. Just curios. I copied the URL into my clipboard and tool everything off of the URL except the ip address. I entered it into Chrome's address bar and Chrome warned me that the site has malware on it and needed approval to connect. Of course I did not but that's how easy someone can be tricked into clicking on the scam fake email emails like this one from eFax. I have seen fake emails from UPS and from xerox copier scanners. This was the first from eFax (for me anyway). Although many users have become sofisti atdd enough to know how to check for fake emails and links , many are still vulnerable to these types of fake spam emails. The content of the email messages most often looks so real that for a average computer user its very difficult to distinguish between a real message and a fake one. I have seen these types of fake scam emails before. I have not received a fake spam efa,x email yet and that. Would be because my spam filter is up to date and preventing them from coming through. I have seen fake spam virus emails from UPS . these fake. Virus efax emails are very similar to those. Less of these fake spam emails will get through as spam filter databases update. As new fake spam my virus emails are introduced, there is an initial period of time that they get past many filters until he filters update and are able to stop them. 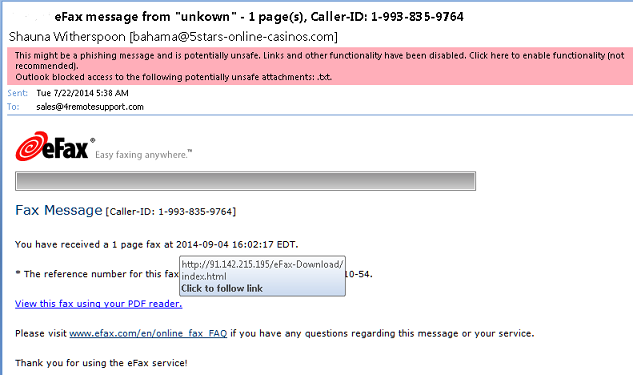 During this window of opportunity, users get once ted with Trojans and viruses from emails such as the one from efax. Received one of these the other day. Don;t know how it got past my spam filter but it might be because the filter did not update yet. Just as stated in the post, if you float your mouse cursor over the links you can see that the URL is not to an efax web site or sub-domain. They are ip addresses and that is always suspicious. too bad many average users don;t know that simple trick .Another thing to look at is the from address. In this case the from email was from an odd domain, not an efax domain. It may have been spoofed to. I had a client that had received one of these scam fax massages. They unfortunately thought it was real. I had recently encountered the Serefef Virus Trojan which I thought had been mitigated and not spreading. It turns out this client has Windows XP and their anti-virus software had expired. Because their AV software was expired, it was not getting updates and therefore the Serefef Trojan was able to get on their computer and infect it. The following post helped solve the problem Remove Serefef Virus Trojan. Afterwards I also ran an online scanner. The online scanner I use the most recently is one by ESET. 4RemoteSupport online software for desktop support is used for remote access and remote control of the computer or desktop through the web. 4RemoteSupport online remote desktop control enables us to remote control the computer PC online over the Internet with file transfer and auto-reconnect capabilities.